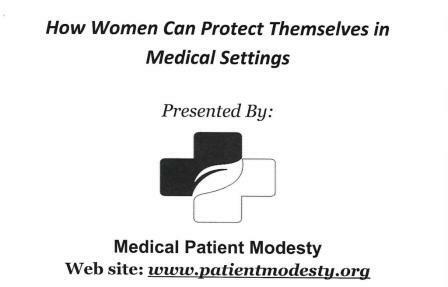 Medical Patient Modesty is distributing a 12-page booklet educating women about how they can protect themselves in medical settings with tips to prevent sexual abuse and modesty violations. The medical industry has become very gender and moral neutral and patients need safeguarding. In society, girls and women are specifically given tips to protect themselves from sexual abuse, but you rarely hear about preventing sexual abuse in medical settings. Sexual abuse in medical settings is more common than many people realize. We need to reach out to as many women as possible with this booklet. Look at the example of Dr. George Tyndall, a full-time gynecologist at University of Southern California's student health clinic for 27 years—who treated many female students and got away with abuse for a very long time. We are selling our booklets in large quantities for people who want to distribute them to multiple women. We encourage college groups or anyone passionate about helping protect college girls to consider buying large quantities—such as 500-1,000 booklets—to distribute at a particular college. College students are most vulnerable. The profits from our booklets will help to pay for shipping and booklet distribution, and to support Medical Patient Modesty’s mission. The more money we secure, the more booklets we will be able to distribute.